- Fiber Glass Fabric Coating, Impregnation , Finishing line with PTFE, Silicone, Graphite, PVC, Bitumen dispersion. - Glass Mesh Fabric or Woven fabric resin reinforcement for Grinding Disk, Grinding Wheel. Our expertise allows us to manufacture and supply a precision engineered range of Mangle Roller. These rollers are widely used in textile plants for various purposes. We use quality raw material for fabricating the rollers to ensure that the final range is defect free. This Swiss-made mercerising machine has a capacity of almost 65000 mtrs / day. A chain-type merceriser, it can control the fabric width as desired to maintain the shrinkage within norms. These energy-saving machines can be used for wet-on-wet processes and facilitate 100% caustic soda recovery. 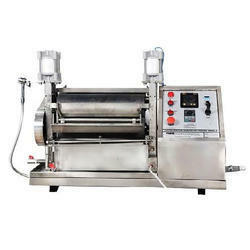 It is also possible to carry out mercerising from 100 cms to 320 cms in this machine.